Megan Mckenna has opened up about a horrific incident she had with a music producer in a hotel room. Writing in her new autobiography entitled ‘Mouthy’, the country singer revealed she was in contact with a music producer who was interested in signing her. Megan wrote about how she was lured to his hotel room where he acted extremely inappropriately. The shocked singer divulged that he “touched himself inappropriately” in her presence. Fortunately she said she managed to flee the hotel room before things got worse. Come and meet me and get a signed copy of my book MOUTHY! At @whsmithofficial Liverpool one! Thursday 26th July! 💋💋💋💋💋💋💋💋💋💋💋💋💋💋💋💋💋 tickets on the swipe up link on my story!!!!!! The man who she called ‘James’ impressed her and her mother before Megan went out to meet him, with his previous work with famous singers such as Labrinth. Megan signed with another producer and over the past two years has been very successful pursuing her country music ambitions. The 25-year-old’s single ‘High Heeled Shoes’ recently hit number one in the country charts. 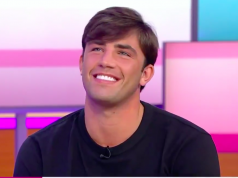 Megan has been making headlines recently after it was revealed that she and Love Island’s ‘Muggy Mike’ called their relationship off, after a brief few months together.